For Liss Fain Dance’s newest performance installation, Z Space was transformed. A house-like steel skeleton had been constructed on the stage with clear cellophane streamers acting as walls. Dedicated large grey squares were to be the dance areas. Benches were placed around the perimeter and there were black corridors between the various ‘stages’. Matthew Antaky’s scenic design spoke of a theme: partitioned but porous. Antaky’s scenic design was the inspiration for Liss Fain Dance’s A Space Divided. For this world premiere project, Artistic Director Liss Fain and guest choreographers Christian Burns and Amy Seiwert each composed a choreographic response to Antaky’s set. The three dances were then woven together, one after the other, to create the hour-long work. And while A Space Divided is definitely an experiment in choreographic vision and interpretation, it is equally an exercise in viewership. As with any artistic installation, the audience was encouraged to move around during the performance; to take in the work at different angles and from various perspectives. This turned the audience into active decision makers. Whether you chose to stay in one place or move around, you had to not only make that choice, but also choose what scene or which dancers you were going to watch at any given moment. Because A Space Divided had the work of three different choreographers, there were three sections within the dance. Yet even with lighting cues, music changes and shifts in the movement style, where one chapter stopped and the next one began wasn’t obvious. Which followed the original theme that had been established: partitioned but porous. A Space Divided was like a fluid stream of consciousness and investigation. I did try and figure out the breakdown, though. And in doing so, had some observations about each choreographic response. Part one, choreographed by Christian Burns, varied in both movement and mood. Near the beginning, there was a sequence were unison phrases were thrown from performer to performer, like a game of catch. One dancer would begin the phrase in one room, would be joined by another dancer in a different space, then the first dancer would stop, a new dancer would join and the game continued on. The open doorways in Antaky’s set also had significance. Rather than solely facilitating a pathway between dance squares, Burns suggested through his choreography that these doors were a kind of invisible barrier. This segment concluded with a sense of community. The five-member ensemble gathered together in various configurations and performed cluster balances. A wide-ranging trumpet underscored Amy Seiwert’s contribution to A Space Divided. From dense chromatic scales to sweet harmonies to avant-garde non-note sounds, it set the scene perfectly for work that had similar breadth. Balletic steps were interspersed into the otherwise contemporary physicality, and the sculptural movement frequently dismantled in surprising ways. In the final episode of A Space Divided, Liss Fain took the choreographic helm. With a text-based score, this last section of the dance featured a real shift between parallel and turned out realities. Dancers Shannon Kurashige and Megan Kurashige swiveled back and forth in plié from parallel attitude to turned out attitude. Positions of the feet also came into play – fifth moved to non-specific parallel, open fourth to sixth position. Again this took us back to the original theme of pliability and change. 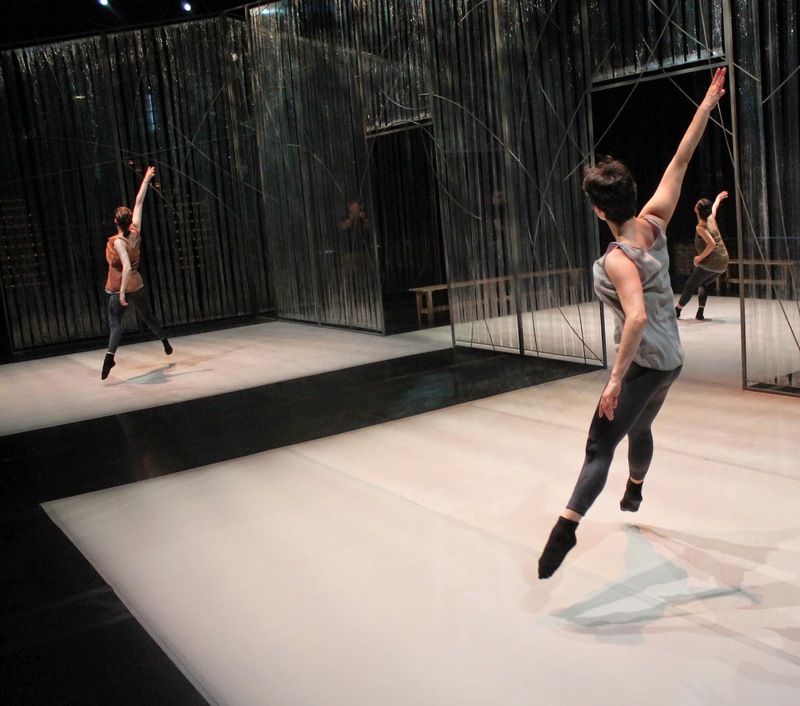 Fain also explored the doorways of Antaky’s set by placing dancers within these open structures. Feet straddled the line between rooms; arms on one side, body on the other. It was a strong statement of being and existing ‘in between’. Liss Fain Dance’s company dancers must be applauded for their performance in A Space Divided. While there were moments of stillness and brief periods of being off-stage, all five were ‘on’ and active pretty much for the whole hour. But speaking of that sixty minutes, while the concept for A Space Divided was both successful and thought provoking, the piece was really too long.